The 168th Associate Justice of the Supreme Court of the Philippines, Jose Catral Mendoza, is an alumnus of DLSL. Well, if you are fussy, technically you can say that he is not. He was among the pioneer class of seniors that the DLS Christian Brothers ‘inherited’ from the Maryknoll Sisters when DLSL began operations in school year 1962-63. The Brothers would not obtain a permit from the Department of Education to operate as La Salle High School until the following school year. At any rate, Justice Mendoza is like me also an Air Force brat. His family lived two houses away from ours inside Fernando Air Base. His father Ibarra – who everyone in the immediate neighbourhood fondly referred to as ‘Tata Baring’ – was an Air Force officer and a close associate of my own late father. In fact, Bambito – as the SC Justice is known among family and friends – along with his priest younger brother Tony are godsons of my father. His mother Teresa was somebody whom everyone fondly referred as ‘Manang Teresing.’ This was because she was a pious churchgoing woman and something was likely not right if she did not pass in front of our house on her way to church early in the morning of each day. Justice Mendoza was born 12 years ahead of me, so it was really more his younger brothers Ibarra Jr. and Franco who were my contemporaries and schoolmates. 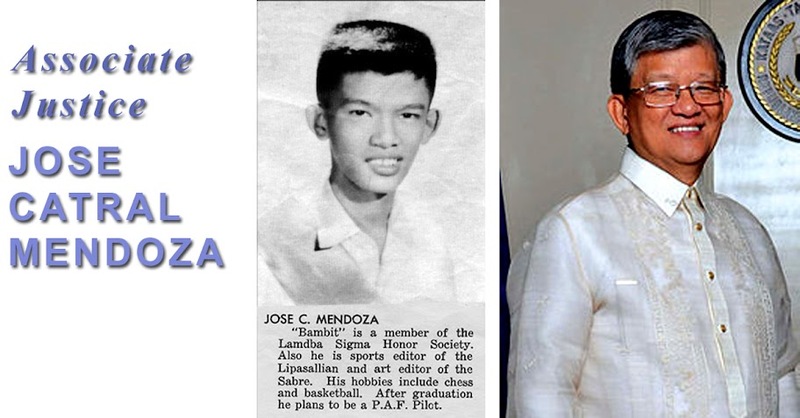 In the Sabre – which was how the DLSL yearbook was known until 1969 – Justice Mendoza stated as his ambition becoming an Air Force pilot. Of course, at the time, he had no inkling that the future would take him to places higher than any Air Force plane could. He would eventually take up Political Science at the University of the Philippines and law at San Beda College. He passed the bar in 1971 and went into private practice before entering government service in 1977 as senior research attorney of the Court of Appeals. He steadily rose up the ranks in the judiciary branch and was appointed Associate Justice of the Supreme Court early in 2010. Among the more celebrated cases he was involved with was one against the Executive Order issued by President Benigno Aquino III establishing the Truth Commission to investigate corruption during the previous administration. The commission was struck down as unconstitutional. Although he has two brothers who are priests in the Catholic Church, he upheld as valid most of the provisions of the controversial RH Bill, albeit after striking down eight major provisions as unconstitutional.